Keep life simple yet unbounded in 2,663 square feet of pure Abdo loft perfection. Stretching out over 2,600 square feet on two levels, Loft 306 is one of the largest units at Wooster and Mercer. In every respect, a sublimely flexible main living space awaits. The gourmet kitchen features a large island facing the huge windows while a specially designed wood base supports a lowered dining height “bar.” Subtly honed black granite counters are sealed for natural stone beauty. Professional grade appliances include the 36″ Wolf range, Sub-Zero side-by-side refrigerator/freezer, GE Monogram convection/microwave oven and dishwasher. In the main floor guest bedroom, a wall-to-wall built-in was designed and commissioned to serve as a dressing bureau as well as perform beautifully as an amazingly well-thought-out desk. You can raise the desktop when company comes and have a lovely guest room with no clutter. Poliform Italian custom closets provide efficient, beautiful, and well-planned areas for all clothing and personal items. An all-room sound system plays different programs in different rooms. There is also a 48” Samsung high-definition TV wall-mounted inside the main floor office/bedroom cabinet. The open, second-story loft provides that extra space you’ve been looking for. A total of three bedrooms and three full baths serve owners and guests with equal comfort and privacy. United design elements across all three bathrooms include natural stone counters, stone tile floors, handsome cabinets, and Waterworks hardware. Other amenities include a whole-house surge protector, two garage spaces and an oversized storage unit. Wooster and Mercer Lofts — Abdo Magic at Its Best. Buyers of Wooster and Mercer properties find these stunning buildings developed by Abdo irresistible. Wooster and Mercer are truly new construction from the ground up incorporating modern design techniques and amenities while embodying the true loft spirit in every unit. 130- and 140-year-old bricks salvaged from the Capital Children’s Museum embellish supporting columns and certain interior walls in Loft 306. The buildings surround a private pool with deck and eating area, with a party room opening onto the pool. An exercise room is well-equipped and open 24×7 to residents exclusively. Work out every day on your own or meet your own trainer for your personal workouts. The front desk is always staffed. An “It” Building Selection in four categories, Wooster and Mercer lofts are coveted as Best Private Outdoor Spaces, Rarely Available, Most Modern and High Demand collections. 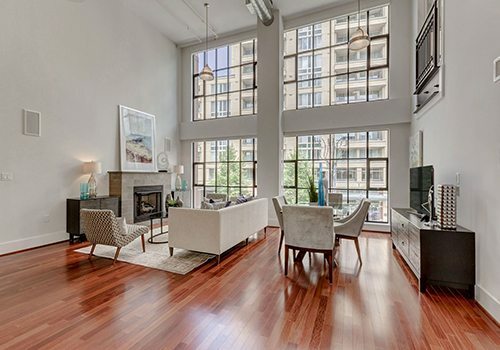 Living in Ultra Chic Rosslyn. And All of Arlington! Just across the Key Bridge from Georgetown, Rosslyn streets are lined with sculpture and multiple arts venues including the Artisphere and the Rosslyn Spectrum Theatre. Wooster owners love to stroll three blocks to the Iwo Jima Memorial, or walk to the back gate of Arlington National Cemetery. A 3-minute drive takes you to Trader Joe’s, and other markets are in the neighborhood. A variety of dining establishments tempt residents including Guajillo, Ray’s Hell-Burger, Pho 75 and Café Assorti. The Metro’s Rosslyn station provides easy access into the city or to nearby Arlington neighborhoods while direct entrance to riverfront trails and parks beckon residents outside. Arlington’s Courthouse and Clarendon neighborhoods serve up a variety of restaurants including Me Jane, Chez Manelle, Fireworks Pizza, Delhi Club, Eventide, Liberty Tavern, Tallula and Minh’s. Shopping incudes Barnes & Noble, Crate & Barrel, Apple, The Container Store and Pottery Barn at The Market Common Clarendon shopping center. Other attractions include Whole Foods, Lululemon Athletica, Free People and South Moon Under. Loft 306 is offered at $1,749,000. Come take the tour. Whether you’re acquiring or selling, make sure you have every advantage working in your favor by hiring the marketing and negotiating expert, Jeff Wilson, with TTR Sotheby’s International Realty. Discover the value and peace of mind that comes from unmatched representation and highly personalized service.